Kind friends and readers have asked me when Deep Water would be available in the States and I am happy to say that US publication was on 27 January. I was lucky enough to have an American publisher for my first two novels, but not since, so I’m delighted to published in the US again. Today my new novel is out. I am delighted with the great job that my publishers have done and it was a thrill to get my advance copy. What a terrific cover! I couldn’t be more pleased with it. It is always a slightly anxious moment when your publisher sends you the cover for your new book and asks for your comments. But when I saw the cover for Deep Water a couple of weeks ago, all I could say was ‘Wow!’ It’s simple, elegant, and striking. The novel begins with a death in a clinical trial so the image couldn’t be more appropriate. And I love the strap line, too. It’s so important what your book wears to go out into the world. First impressions do count when someone is browsing in a bookshop or on-line. Publisher have the final say and sometimes they chose something that they think will sell even if it doesn’t reflect the content of the book. That’s not fair on author or reader. It happened to my friend Sue (over at SueHepworth.com) whose publishers picked a pink and frilly chick-lit cover for Zuzu’s Petals, her comedy of middle-aged love and loss. It wasn’t appropriate and she hated it. I have been lucky on the whole with my covers – I especially liked the US editions of Murder is Academic and Stage Fright – but I really think this is the best so far. 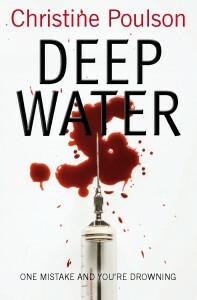 Deep Water will be published by Lion Fiction in October in the UK and in January in the US.